2010 is half over (yeeks) and it’s flying by. Case in point, May flew by like Superman away from Kryptonite. I was so busy I barely got a chance to breathe. This weekend I’m lying low and catching my breath. May 1: Dinner at the Oasis for my sister’s birthday. I love the Oasis. Watching the sun set over Lake Travis and having dinner with friends is one of the best things in existence. May 8-9: Various stuff, nothing exciting. Maybe I did get a weekend off in May. Darn you, unbusy weekend, for ruining my perfect record. May 15: Andrea and Justin’s boat party to celebrate their graduation from UT Law. What an amazing time. Definitely one of the best parties I’ve ever been to. May 16: Blair was in town this weekend for her friend’s bachelorette party and she had a dinner at the Clay Pit with her Austin friends. Love Clay Pit, love Blair. Fab evening. 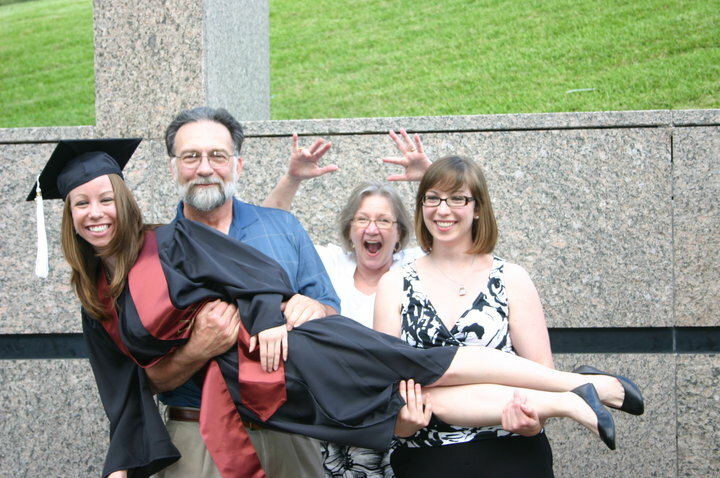 Thursday May 20–Sunday May 23: My little sister graduated from UT this weekend with a B.A. in Theater Studies. So proud, etc. Mom and Dad got into town on Thursday evening, and I took work off on Friday for the ceremony. My godmother, Aunt Chris (after whom I’m named), and her hubs, Greg, were also in town for Jackie’s graduation and we all had dinner that night. Saturday we did random family stuff, and that night after my parents went to bed I met Brandan and her friends downtown for Brandan’s law school graduation. Sunday Mom and Dad left, and I slept. We got some amazing family pictures. See below. Friday May 28-Monday May 31: GALVESTON! Blair’s bachelorette party was this weekend in Galveston. Emily M. and I drove down Friday after work and I returned Monday. We rented a condo and had a grand time, sans the nasty little devils known as sand fleas and the plague-like infestation of mosquitoes. …And now it’s June. This weekend I decided to do NOTHING except relax because after May’s insanity, I sure needed it. My sister, Jameson, and Annette were at my place one Saturday night to watch Saturday Night Live (which no one has actually sat down to watch since Will Ferrell was on) because Tina Fey was hosting and we’re all 30 Rock/Mean Girls fans. The whole episode was pretty funny, but one skit had us all crying laughing: Brownie Husband. I have never ever been in a room of people laughing as hard as we were laughing at this sketch. I almost peed myself when she took a bite off the face and caramel oozed out. I tried to embed the video, but WordPress won’t let you embed anything that’s not from YouTube and the clip’s not available on YouTube, so you get a link instead. Deal with it. Fast forward a few weeks, and my little sister will turn 22 in a week or so. We were having dinner and giggling about Brownie Husband and then one of us decided that I should make her a Brownie Husband for her birthday. So that’s what I’ve spent my whole afternoon trying to do. I know the pic quality’s not great, but if you look closely you can see my failed attempt to wrap the aluminum foil around the cardboard. Poor husband. Everything is lopsided. 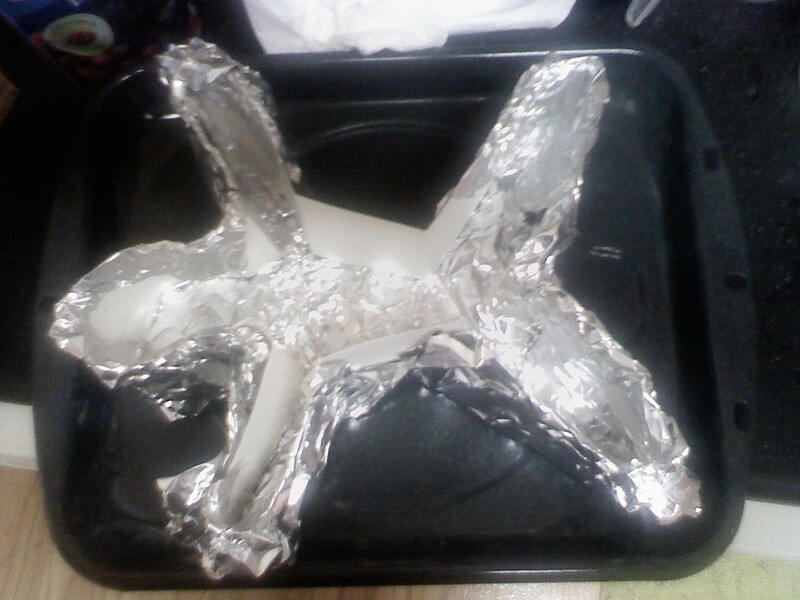 Even if the mold would have actually held the brownie mix into a single shape, that shape would likely have fallen apart when I tried to get it out of the mold. Or the brownie husband would have had bits of aluminum in him. Although that’s bound to happen to him when he gets older, anyway. I took her advice. 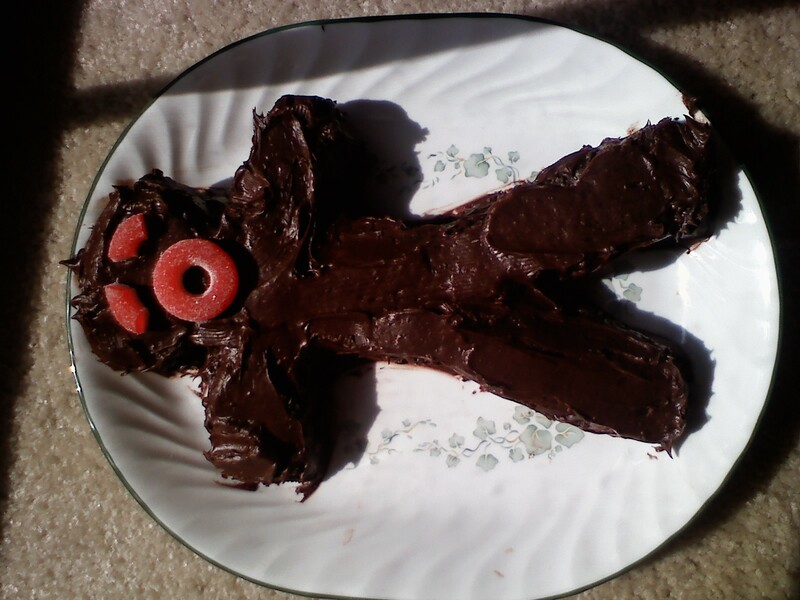 I baked a pan of brownies, then after it cooled, I turned it onto a plate and carved a man shape out of it, which I then frosted and gave candy eyes and mouth. Finally, a real Brownie Husband Jackie can call her own! Even though he kinda looks like a chocolate Gumby. Do not drdp. 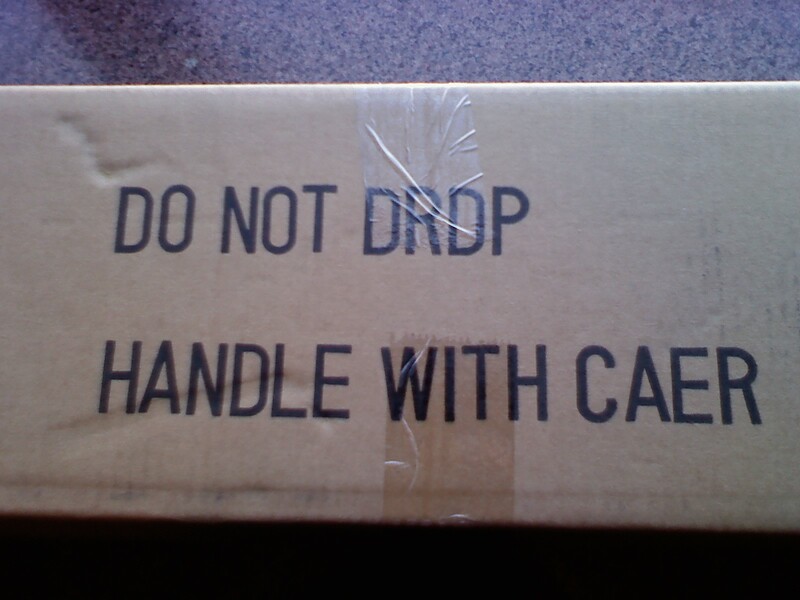 Handle with caer. I saw the below package in my office yesterday. Just had to share. At this rate, my blog will cease to be about me and become about the egregious spelling and grammatical errors in my life. I win at the Internet! 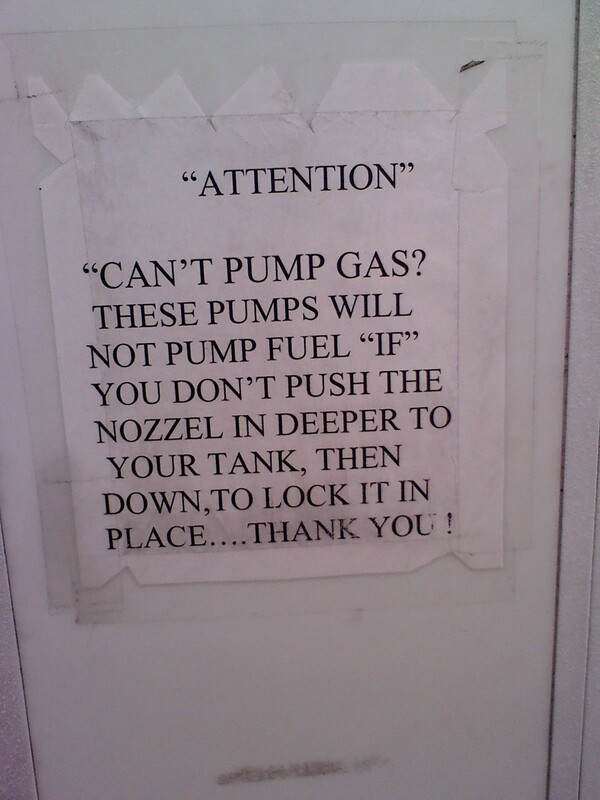 Remember this post about the headache-inducing sign I found on a gas pump that featured so many spelling, grammatical, and punctuation errors that I had to send it in to The “Blog” of “Unnecessary” Quotation Marks? They published it! I am now Internet-famous. Not really, but it is really cool to contribute something to the Internet instead of mindlessly consuming. The post got a fair number of comments and directed a ton of hits to my blog, which also got several comments. I feel so special! This must be what Dooce feels like every day. 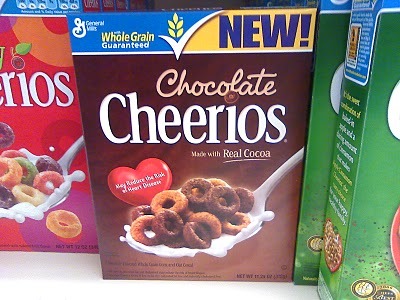 In other news, CHOCOLATE CHEERIOS! I saw these yesterday at HEB and of course I bought some because I am Christine and am 90% composed of chocolate. 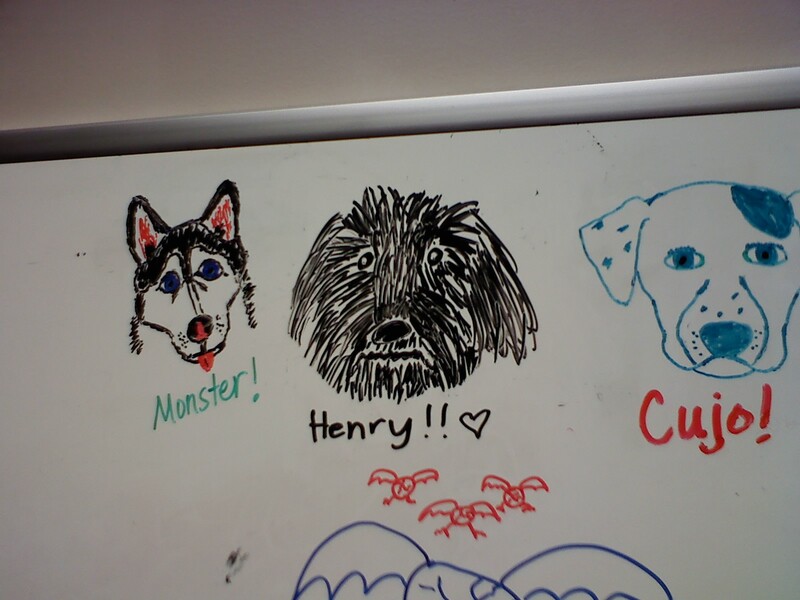 And they were actually pretty good! The best part of any chocolate cereal, like Cocoa Pebbles or Count Chocula, is the chocolate milk left behind. I discovered the show Who Do You Think You Are? last night. (Spoiler alert! Stop reading unless you’re never going to watch the show.) WDYTYA? is a seven-episode documentary miniseries that explores the ancestry of seven celebrities: Sarah Jessica Parker, Lisa Kudrow, Emmitt Smith, Spike Lee, Matthew Broderick, Susan Sarandon, and Brooke Shields. It’s the US version of a show by the same name that’s been airing in the UK since 2004 that has explored the ancestry of David Tennant, Jeremy Irons, Julia Sawalha (Lydia in BBC’s Pride and Prejudice), John Hurt (who I didn’t know was British until just now despite his role as the dragon on Merlin), Jerry Springer (who is ALSO British?! ), Kim Cattrall (Samantha is from Liverpool?! ), and Martin Freeman. Damn, UK, good job on producing awesome people. Each person starts with little clues about their heritage and flies wherever their journey takes them to enlist the help of historians and local records to trace their ancestry. 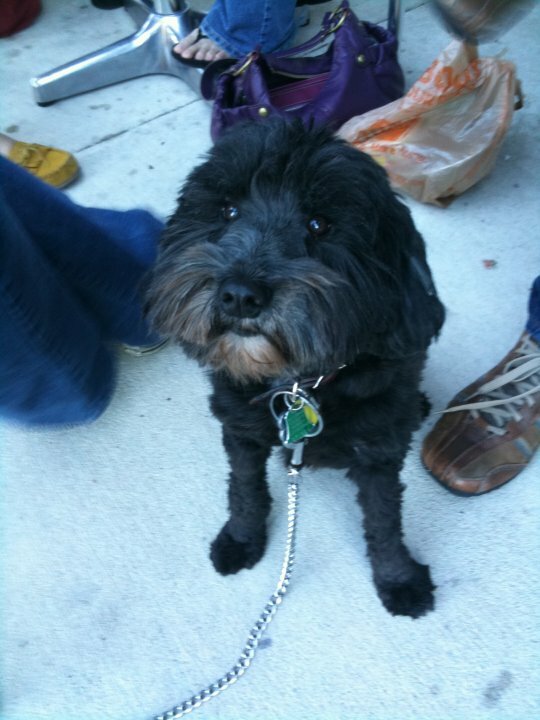 I watched the episodes on Sarah Jessica Parker and Lisa Kudrow and was totally moved and touched. Sarah Jessica Parker didn’t have much more to go on than the name of her great-grandmother, Lillian Hodge. A historian found information on Lillian Hodge’s family, and SJP flew all over the U.S. and traced her ancestors back to a man who went to California during the Gold Rush not knowing his wife was two months pregnant. He died in California, never knowing his son. Then SJP traced her history even further back and she discovered her ancestor Esther Elwell and two other women were accused of witchcraft in connection with the death of a woman named Mary Fitch during the Salem Witch Trials. A seventeen-year-old girl accused the three women. Her evidence? She saw the women kill Mary Fitch in a vision, and the Salem Court of Oyer and Terminer, the court formed specifically to try people accused of witchcraft, admitted her visions as valid evidence. Everyone tried by the Court of Oyer and Terminer was convicted and hanged. EVERYONE, all 20 people. Miraculously, the court dissolved before Esther’s case could be tried, and she survived to go on and continue the family line that leads down to Sarah Jessica Parker. The rise of the ubiquitous cell phone has apparently spawned a new way for people to interfere with their friends’ dating lives. 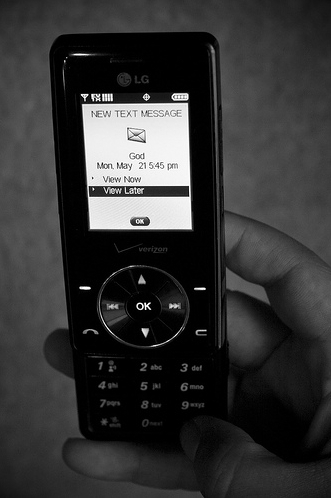 I am, of course, talking about the text from “God.” Apparently now people will torment their friends who have gone on a date with someone and are waiting to hear from them by stealing their friend’s cell phone, getting the date’s number, and sending the date a message from the friend’s cell phone that says, “Dear Date, call My Friend. Love, God.” Obviously it’s meant to imply that you two are so great together that God is rooting for you, but it really just freaks out the recipient and effectively destroys any chance for a second date. Ha!!!! I was trying to find a graphic for this post so I Googled “text messages from God” and I found the below here. GOD TEXTS THE TEN COMMANDMENTS. Yesterday was President’s Day (and Susan B. Anthony’s birthday!). Banks, the post office, most government agencies, and several universities, including UT, were closed, as were most businesses. At least I thought most businesses were closed yesterday because there was exactly zero traffic heading downtown during rush hour. But this morning I heard on the radio that in Austin only 5% of businesses were closed yesterday — not enough to cause the dearth of traffic. The only conclusion I can come to is that the vast majority of traffic in Austin is not workers, as I had thought before, but UT students. This begs the question, why do so many students live so freaking far from campus? I live several miles north of downtown, so far north that some of my friends refuse to drive up there, and my commute is nightmarish, presumably because of the students who live around my area. Is there really so little housing close to UT that students are forced to live in Austin’s boondocks and suffer 45-minute commutes to class? Or are the ridiculous housing prices close to campus and downtown to blame for the mass exodus from Central Austin? Whatever the reason, I am annoyed. 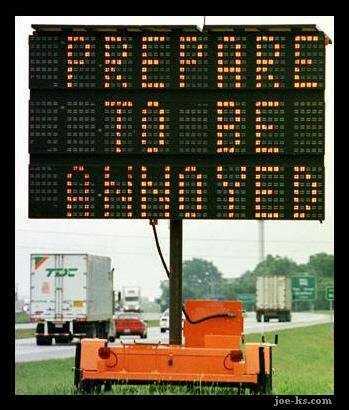 Just like the person who programmed this sign. 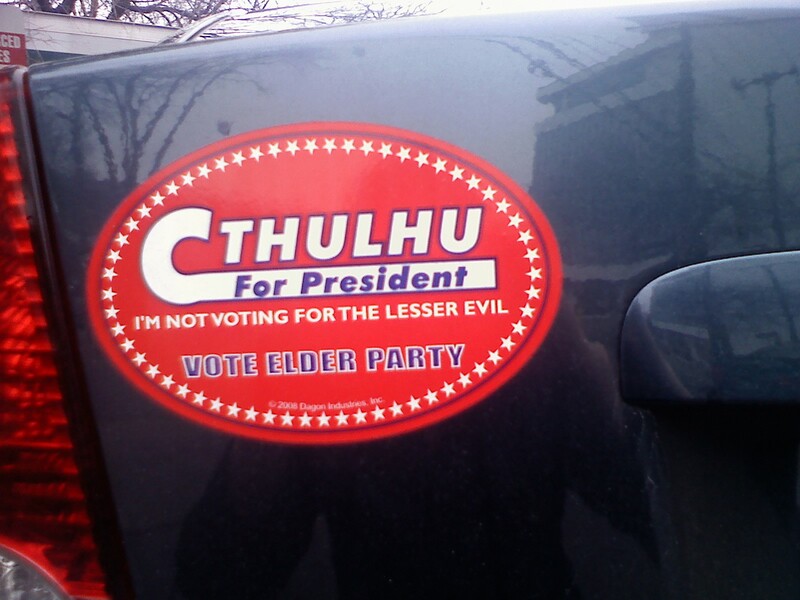 Cthulhu in the White House! Cthulhu was last sighted in the parking lot behind Einstein’s bagels. Boy may be evil, but you gotta give him props for his good taste in bagels. I see you, sly political statement. I snapped this at a gas station on the drive from Austin to Dallas I took on Friday. In addition to the fact that you don’t have to mark headings with quotation marks, it seems like the author did not finish his or her thoughts due to the lack of ending quotation mark in the body of the text. This sign was presumably made in a word processor, and last time I checked, those came with spell check. 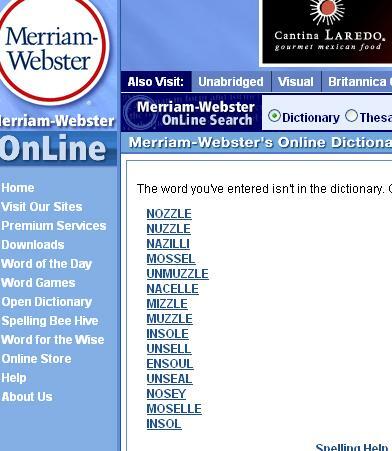 So there is really no excuse for “nozzel.” Even the WordPress spellchecker knows that’s wrong. This also renders inexcusable the space between “you” and the exclamation point, as spell check would know that the only punctuation mark that is ever acceptable with a space before it is the em dash — don’t you agree? Think I should submit it to the “Blog” of “Unnecessary” Quotation Marks? I think so. I am shocked, I tell you. SHOCKED!